I want to implement barcoding...where do I start? The UPC code is widely utilized in North America, the U.K., Australia as well as New Zealand. UPC-A is the most common format which comprises 12 numerical digits. Most of us are familiar with seeing this barcode on products or items we purchase from retailers. The UPC codes are also referred to as a GTIN ~ Global Trade Item Number which comprise of a Company Prefix and the numbers the company has assigned to that specifc item. In the United States, the Company Prefix is issued by GS1. GS1 is a non-profit standards based organization that supplies GS1 US company prefixes that are authenticated and accepted by all retailers. EAN has been adopted as the International Article Number but retained the EAN abbreviation. The EAN code is a 13-digit barcode format (12 data and 1 check digits) and it conforms to the original 12-digit UPC code developed in the United States. The EAN-13 barcodes are used worldwide for marking products often sold at retail point of sale. Who needs a UPC/EAN code? If you are a supplier or manufacturer that sells to distributors or retailers then your products may require a UPC barcode that represents the GTIN. If you do not plan to sell the items that you want to barcode to retailers for resale, and you simply want them barcoded for internal purposes i.e. for asset tracking, then you DO NOT need to get a Company Prefix from GS1 for a UPC code. In this instance, you can use any numbering system you choose, and any barcode type you want. Register for a company prefix with GS1 US to get started. This registration process is quick and easy and requires some basic information about your company and a registration fee. Once you receive your prefix, you can create barcode numbers (GTINs) for each product you're selling. 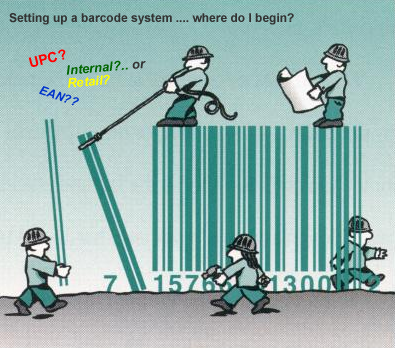 This is part 1 of 4 on the Understanding Barcoding and Barcode Implementation article series. Subscribe to our blog and follow this series. Part 2 of 4 talks about "What hardware will I need to purchase to implement barcoding system?"